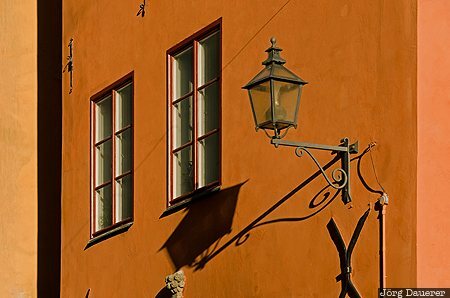 A street lamp and its shadow at a typical orange facade in Gamla stan (The Old Town) located on the island Stadsholmen in Stockholm illuminated by warm morning light. Stockholm is in Stockholms län, Sweden. This photo was taken in the morning of a sunny day in September of 2014. This photo was taken with a digital camera.